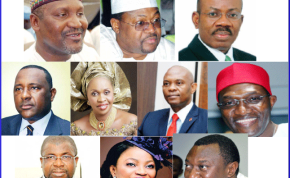 Some of Nigeria's super rich. To make wealth is an achievement; the way it is spent is style. In most cases, successful individuals who have created wealth through wise and diligent investments in business hardly squander their money. They usually prefer to reinvest their capital, including the accrued profit over the years, into their businesses to increase their asset base and level of affluence. Nigerian business tycoon Aliko Dangote is the richest man in Africa. He is the founder, Dangote Group, West Africa's largest publicly listed conglomerate with diverse business interests such as sugar refining, flour milling, textiles, real estate and salt processing. Dangote Cement, Dangote Foods (noodles) and Dansa Juice complete the chain. His total net worth is about $16.1 as at March 2013. Dangote spends money in philanthropic activities. He has stepped up his philanthropy in recent years, giving over $100 million to causes ranging from education and health through flood relief, poverty alleviation to the arts. He acquired a private jet in April 2010 as a personal gift on the occasion of his 53rd birthday. The Bombardier Global Jet Express XRS (one out of a few) was estimated to cost $45 million. Dangote is also said to have purchased a private luxury yatch at the cost of $43 million made exclusively for his enjoyment. The yatch is named Mariya after his mother. Otunba Mike Adenuga built his fortune in business from banking, mobile telecom service and oil. He founded Globacom, now Nigeria's second largest mobile phone network, in 2006. Globacom has more than 24 million subscribers in Nigeria, and also operates in the Republic of Benin. Adenuga made his first fortune at the young age of 26 in the 1970s by distributing lace and other materials. He later had another opportunity to expand his fortune during the military regime of Ibrahim Babangida when he was awarded a contract for the construction of military barracks in some military installations in the country. He is presently worth $4.7 billion, thus justifying him as one of Nigeria's super-rich businessmen. Adenuga is a philanthropist who spends a lot of money on selfless activities aimed at bringing succour and assistance to less-privileged people. Adenuga also takes his philanthropic goodwill to the area of sports development in Nigeria and Africa through his selfless investments in sports. His demonstration of philanthropic largesse cuts across sponsorship of Nigerian Professional Football League (NPFL) and the Super Eagles. This was one of the points highlighted by President Goodluck Jonathan at his (Adenuga's) 60th birthday. "You are celebrating 60 years of a remarkable life filled with monumental achievements in high entrepreneurship, philanthropy and dedicated service to God and country," the president said. Similarly, the president of the Confederation of African Football (CAF), Mr Issah Hayatou, used the occasion of Adenuga's birthday celebration to appreciate his contributions to the society. He recognised that Adenuga had not only affected Africa positively through his accomplishments in business but has also been the pillar of sports on the continent. Adenuga loves spending money on what gives him joy. It could be said that, partly for this reason, he acquired a private Bombardier Global Express jet, fitted with the latest flight facilities. It is one of the most luxuriously built private jets in the world, just like that of Dangote. Jim Ovia started building his fortunes when he founded Zenith Bank Group in 1990. The bank has grown to become West Africa's second largest financial service provider by market capitalisation and asset base. His sources of wealth are banking, telecommunication and real estate investment. He also owns Quantum Luxury Properties Limited, a private equity fund with special focus on Africa. Ovia's total net worth is about $825 million. He has embarked on the establishment of a free, co-educational high school, James Hope College, in Delta State, the place where he pondered his future as a young man. The school, an 18-month project, launches in September with an initial capacity for 420 students. He is also the founder of Mankind United To Support Total Education (MUSTE), an organisation providing scholarships for the underprivileged. Lagos-based business tycoon Abdulsamad Rabiu is a son of Khalifa Isiyaku Rabiu, one of Nigeria's most successful businessmen in the 1970s. Little wonder therefore that he followed in his father's footsteps in business with interest in importing basic commodities such as rice, sugar and cement in the 1980s. Abdussamad heads the BUA Group, a conglomerate with $1.9 billion in revenues and interests in sugar refining, vegetable oil processing and flour mills. The BUA Group also operates the BUA Cement, Nigeria's first floating cement terminal, as well as Nigerian Oil Mill which processes edible oil. According to Forbes magazine report, he is the 21st richest African and is worth $675 million. Billionaire oil tycoon, fashion designer and philanthropist, Mrs Folorunsho Alakija is worth at least $3.3 billion against a recent Forbes' rating which quoted her net worth as $600 million. She began her professional career in the 1970s as secretary of defunct International Merchant Bank of Nigeria, one of the country's earliest investment banks. In the early 1980s when banking was seen as one of the most lucrative jobs, she took a bold step towards realisation of her personal dreams by quitting her job in the bank to study Fashion Design in England. She returned to Nigeria a few years later to establish Supreme Stitches, a high-profile fashion firm which provides special services to exclusive clientele. She also founded Rose of Sharon Foundation, a charity organisation. This fashion design business led her into fortune. She was in a position to make and sell high-level clothing to the fashionable wives of some military big shots and other society women. In May 1993, Mrs Alakija set out for oil business. It was then she applied for an allocation of oil prospecting licence (OPL) to explore 617,000-acre block granted to her company, Famfa Oil Limited. However, at that time, she had no experience in oil exploration -- she was just a new entrant in the business. Also, Mrs Alakija is widely reported to own a private jet, Bombardier Global Express 6000 which cost about $46 million, added to acquisition of a property at Hyde Park. This is one of the ways she spends her wealth, which gives her happiness. Furthermore, she is a philanthropist who derives joy in giving assistance to widows and other less-privileged in society. Mr Tony Elumelu (CON) was born in Jos on March 22, 1963. He is a renowned economist, banker, investor and generous philanthropist. Elumelu is a recognised African leader in corporate business. After leading United Bank for Africa (UBA) Plc to a higher level with the acquisition of Standard Trust Bank (STB) during the consolidation of the banking industry in 2005, he retired from the management of UBA in July 2010. On establishment of the Tony Elumelu Foundation, he stated the foundation's objective as to "prove that the African private sector can itself be primary generator of economic development". Among the roles of the foundation are deployment of resources to generate reliable solutions to the business constraints that derail and clog the growth of business in the private sector in Africa. Moreover, Elumelu ploughs a lot of resources in philanthropic activities. Apart from the Tony Elumelu Foundation, he was also a member of the World Economic Forum's Regional Agenda Council on Africa. He is also part of the Bretton Woods Committee which brings leaders in the global banking industry together. Voluntary development of human capital is one of the cherished interests where Elumelu spends his wealth. He also partners with the Tony Blair Africa Governance Initiative (AGI) with high focus on strengthening the role of the private sector in economic transformation policies of some African countries. This partnership is named Blair-Elumelu Fellowship Programme. Elumelu, the originator of the concept of Africapitalism as an economic philosophy that reflects the commitment of players in the private sector towards the economic transformation of Africa through long-term investment, is a consummate patriot with a full-blown obsession for how he can make his country and continent a better part of the world. Interest in paying family hospital bills, unpaid school fees, providing for families who cannot provide their needs -- all form part of what Elumelu does through his catalytic philanthropic method of assisting human beings within the shores of Nigeria and Africa. Hajiya Bola Shagaya is hailed as one of Nigeria's richest businesswomen. She is the CEO of Bolmus International Limited. She has interests in several sectors ranging from oil and gas, banking, cash crops export, real estate, fast-moving consumer goods and photography. She has been a very influential figure in Nigeria's corridors of power for decades and has excelled in a society where the role of women has been restricted traditionally. Her rise to affluence and power is not attributed to parental or marital influence. This woman of means has skilfully built her network and wealth from a humble background, and has proven herself as an outstanding power broker with impressive entrepreneurial skills. In the manner of an astute entrepreneur, she saw opportunities in the populous image-conscious Nigerian market, prompting the expansion of her Konica marketing operations to photo laboratory services; that was the birth of another of her companies - Fotofair (Nigeria) Limited. Today, Fotofair is a leading photo laboratory company in Nigeria with over 30 laboratories spread across the nation. Hajiya, as she is fondly called, has impressively carved her path in the sixth-largest oil producer's oil and gas sector. As far back as the late 1980s, during the Gen. Ibrahim Babangida-led military administration, she had steered her oil and gas company through the highly connected and contested Nigerian oil and gas sector to secure allocations for oil blocks. Thus began her reign as an indigenous oil marketer. Around 2005, she became the managing director of Practoil Limited and, in 2011, she founded another exploration company, Voyage Oil and Gas Limited. Shagaya, who is of Yoruba extraction, a tribe distinguished as party enthusiasts of the over 200 tribes in Nigeria, often attends the biggest social events dressed in "anko" with Nigeria's first ladies -- a local practice of Nigerian women indicating bosom friendship by wearing the same traditional attire especially to social functions. The one-time patron of the Fashion Designers Association of Nigeria (FADAN) is a collector and retailer of the finest and most exquisite jewelleries from different fashion capitals of the world. "I love fashion, artworks and beautification endeavours," she said. The graceful billionaire is not all about heavy-weight work. "I'm also a lover of sports, especially Polo", she said. She has consistently supported Polo tournaments in Nigeria over the years. Femi Otedola is the CEO of African Petroleum Plc. He was one of only two Nigerians (alongside Aliko Dangote) to appear on the 2009 Forbes list of 793 dollar-denominated billionaires in the world, with an estimated net worth of over US$1.2 billion. Femi Otedola is the Nigerian president and chief executive officer of Zenon Petroleum and Gas limited. Forbes magazine estimates Femi Otedola's net worth at $1.2 billion and ranks him as the 601st richest person in the world. According to Encomium magazine, Femi Otedola's net worth is $3.5 billion. He owns a private jet called Challenger Global 5000 and a yatch almost similar to Dangote's named Nana after his wife. Sir Emeka Offor, as he is often addressed rarely grants interviews, rather, he prefers his works, businesses and philanthropy to speak for him. His multi-million business interest, Chrome Group, is a multifaceted organisation which originally started as an engineering outfit handling projects such as refinery maintenance, has today become by the grace of God, a conglomerate with diverse interests in Oil and Gas, Finance/Investments, Telecommunications, Insurance, Maritime, Destination Inspection, Real Estate and the Power Sector. He once said in a newspaper interview that he is a son of a policeman, born in Kafanchan in Kaduna State. Offor is a goal-getter and founder of Sir Emeka Offor Foundation, a platform through which he doles out millions of naira for philanthropic purposes. A member of Rotary International and deeply involved in the 4 cardinal pursuits of the Rotary Foundation, which are; peace and Conflict Management, Maternal and Child Death, Basic Education and Literacy, and Polio and Guinea Worm Eradication. He has made an outstanding donation of 250,000 USD for Peace studies at Chulalongkorn University in Bangkok, Thailand, $250,000 for Polio eradication; $250,000 for Guinea worm eradication; and another $250,000 for Women empowerment programmes in Nigeria. He was inducted into the Foundation Circle of the Arch Klumph Society of the Rotary Foundation of Rotary International, an honour reserved for individuals who have donated over $250,000 to its causes. Through his Foundation, he has donated over $1 million, making him the highest donor from Africa. This Anambra State-born politician and businessman has heavily invested in education. The Sir Emeka Offor Foundation is the largest single sponsor of Books For Africa, a non-profitable organization, bringing in over $10 million worth of books, computers and other educational materials to our national institutions of learning and public libraries. He was reported to have also used his money to enthrone a governor in his home state. Initially named Nnamdi Uba and currently a member of the National Assembly as a Senator of the Federal Republic, Senator Andy Uba is a member of the famous Uba family in Anambra State. He is stupendously rich and was reported to have declared his assets to be worth N3trillion though he denied ever doing so. Uba has a lot of lucrative business interests and he is connected with a number of charity works via a Foundation. Aspiring to win the coming National Beauty Contest.